Welcome to John Jewell Aircraft's home on the Web. We're glad you stopped in to see us! We're pleased to extend the same quality and professionalism you've come to expect from us to the internet, by offering you a look at our varied products and services. Browse our site and feel free to contact us. 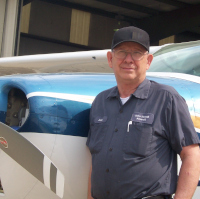 "We have seen many changes in the General Aviation Industry over the years. One thing, however, has not changed; dependable aircraft maintenance is a necessity. Costs are constantly rising, and I understand the dilemma of receiving high quality at reasonable costs. This can best be offered through experience and efficiency. I have affirmed this as my ultimate goal since 1966, and will continue the same high quality of craftsmanship in the years to come." Disclaimer: Material presented on the John Jewell Aircraft website is intended for information purposes only. Posting and/or maintaining this website and its contents does not constitute maintenance advice or the provision of maintenance services. John Jewell Aircraft is a Mississippi Corporation and located within the boundaries of Mississippi, USA. Customers of John Jewell Aircraft are considered to be Mississippi customers regardless of the address of aircraft registration, customer billing address, or origin/final destination of completed services. Services performed by John Jewell Aircraft are performed under the laws and jurisdiction of Mississippi, USA. Some links within this website may lead to other sites. John Jewell Aircraft does not necessarily sponsor, endorse or otherwise approve of the materials appearing in such sites.